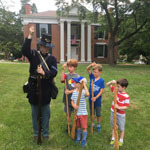 Camp Wornall/Majors allows children to immerse themselves in history through activities, presentations, crafts, games, and more! All of our camp days stand alone, but also work together to create a complete experience . Choose the topics your children find most engaging, or completely immerse them by registering for an entire week of camp. Our new camp system gives you complete control over your child’s schedule. Mix and match and create the schedule that works for you. Register by March 31 to receive an entire week of camp for $200!